Published August 6, 2015 at 337 × 336 in Stan and Jean Clarke. 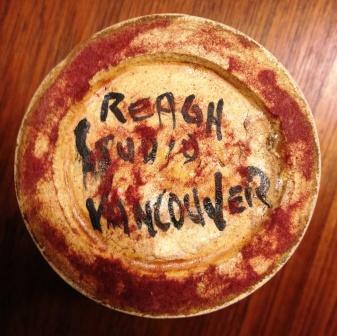 Clarke Signature: “Reagh Studio Vancouver.” David Carlin Collection. Hi, Geri. Thank you for wanting to share the salt and pepper makers. Would you please include in the photographs pictures of the signatures? Also, if you could include the size (height and width) and any information as to where you got them from and how long you have had them it would be appreciated. The email address is studioceramicscanada@gmail.com. Thanks again.